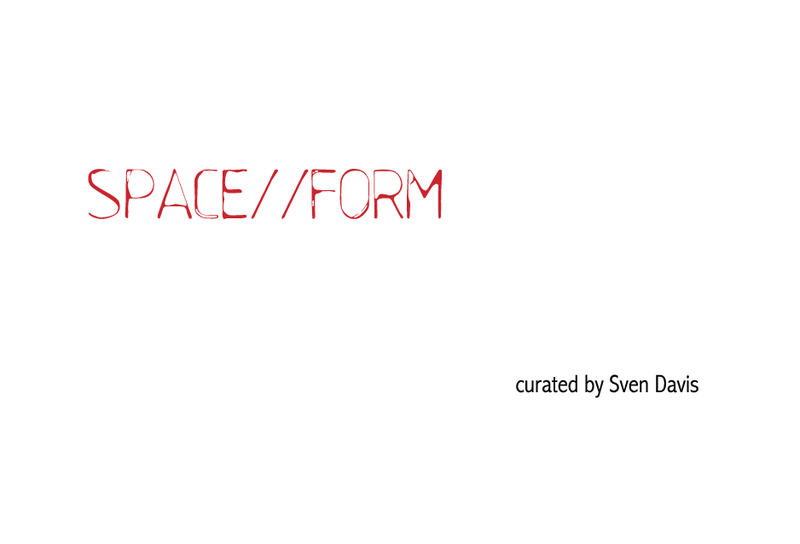 Following our recently curated group exhibitions in Hong Kong; East West Connect and Los Angeles; City of Fire, AM’s UK correspondent Sven Davis has branched out with his own curatorial endeavour Space//Form. The group exhibition brings together over 100 young contemporary artists, and opens 6th September at Portland’s Breeze Block Gallery. Curator, Sven Davis, has worked in architecture for over 20 years, so the thematic center of the exhibition is close to his heart as Space//Form centers around notions of the architectural landscape. Each of the artists were given an identical 10×10 inch panel and invited to create a work depicting their interpretation of space and form within either the constructed or the natural environment. The exhibition also serves as a comparative exercise in how different individuals respond to a single set of prescribed criteria. All of the participating artists were given the same commission guidelines and an identical surface material to work with. ]Each unique interpretation of the brief has led to the creation of a new artwork specifically for the show. The disciplines of art and architecture traditionally enjoy a symbiotic relationship, and the parallels run deep between the conception and realization of an architectural project and the exhibition itself. Aakash Nihalani, Adam Normandin, Adam Wallacavage, Alex Lukas, Alicia Dubnyckyj, Amy Casey, Anthony Zinonos, Augustine Kofie, Ben Eine, Bill McRight, Blaine Fontana, Brendan Monroe, Brett Amory, Carl Cashman, Carl Riddle. Cheryl Molnar, Chloe Early, Chris Ballantyne, Chris Scarborough, Christian Mendoza, Christopher Derek Bruno, Clayton Brothers, Cleon Peterson, Dabs Myla, Dana Brown, Dave Kinsey, David Kassan, David O’Brien, Deedee Cheriel, Doze Green, Drew Tyndall, Eric Shaw, Eric White, Erik Mark Sandberg, Francesco Igory Deiana, Frank Gonzales, Gary Taxali, Geoff McFetridge, Ghostpatrol, Greg Eason, Greg Lamarche, Hamishi, Henry Gunderson, Ian Francis, Jacob Magraw Mickelson, James Marshall (Dalek), Jason Thielke, Jeff Depner, Jeff Soto, Jim Houser, Jordin Isip, Josh Keyes, Joshua Krause, Judith Supine, Kai & Sunny, Karin Krommes, Karl de Vroomen, Katrin Fridriks, Kenji Hirata, Kevin Cyr, Kevin Earl Taylor, Kevin Peterson, Kid Acne, Kozyndan, Kris Lewis, Kristen Schiele, Lex Thomas, Logan Hicks, Lola Dupré, Louis Reith, Lucas Price, LX One, Mario Wagner, Marissa Textor, Mark Dean Veca, Mark Schoening, Mark Warren Jacques, Mark Whalen, Mars-1, Martin Wittfooth, Mary Iverson, Matt Leines, Maya Hayuk, Michael Murphy, Mike Stilkey, Moneyless, Nick Walker, Pakayla Biehn, Paul Insect, Pete Watts, Reginald S. Aloysius, Remi Rough, Rich Jacobs, Richard Colman, Ricky Allman, Rostarr, Russell Leng, Ryan Shaffer, Ryan Stewart Nault, Sage Vaughn, Saner, Seonna Hong, She One, Sidney Pink, Sinc, Slinkachu, Stephanie Buer, Sweet Toof, Teresa Duck, Tim Biskup, Tom French, Tristram Lansdowne, Wayne White, Will Barras, Winston Smith. The common surface media are museum quality painting panels supplied and manufactured specially for the exhibit by Ampersand Art Supply. All of the artwork is to be hung in a huge grid, so watch out for some high quality presentation for the show. The exhibition will also be accompanied by integral installations by Mark Dean Veca and Michael Murphy. 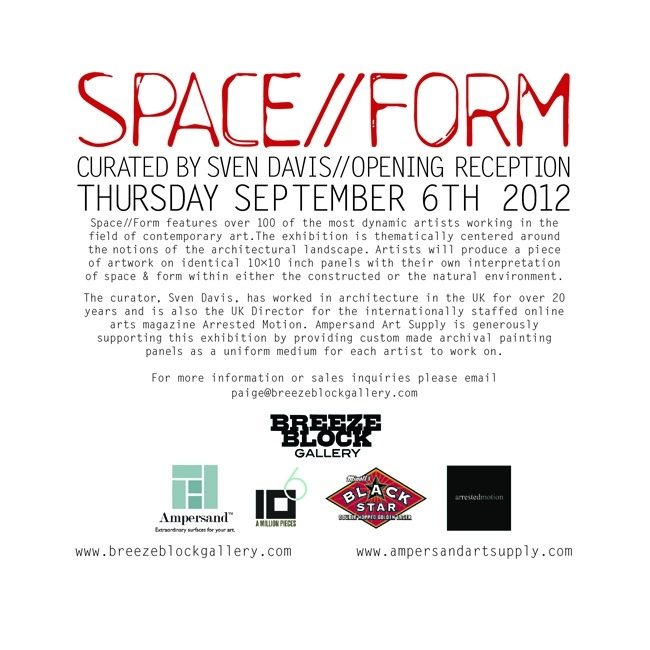 The exhibition runs from September 6-29, 2012. Watch out for more information on the show from AM as we’ll start to reveal some of the images of the work as the opening approaches. Categories: Architecture, Art, Contemporary Art, Shows & Events, Street & Urban Art. Tags: Aakash Nihalani, Adam Normandin, Adam Wallacavage, Alex Lukas, Alicia Dubnyckyj, Amy Casey, Anthony Zinonos, Augustine Kofie, Ben EINE, Bill McRight, Blaine Fontana, Breeze Block Gallery, Brendan Monroe, Brett Amory, Carl Cashman, Carl Riddle. 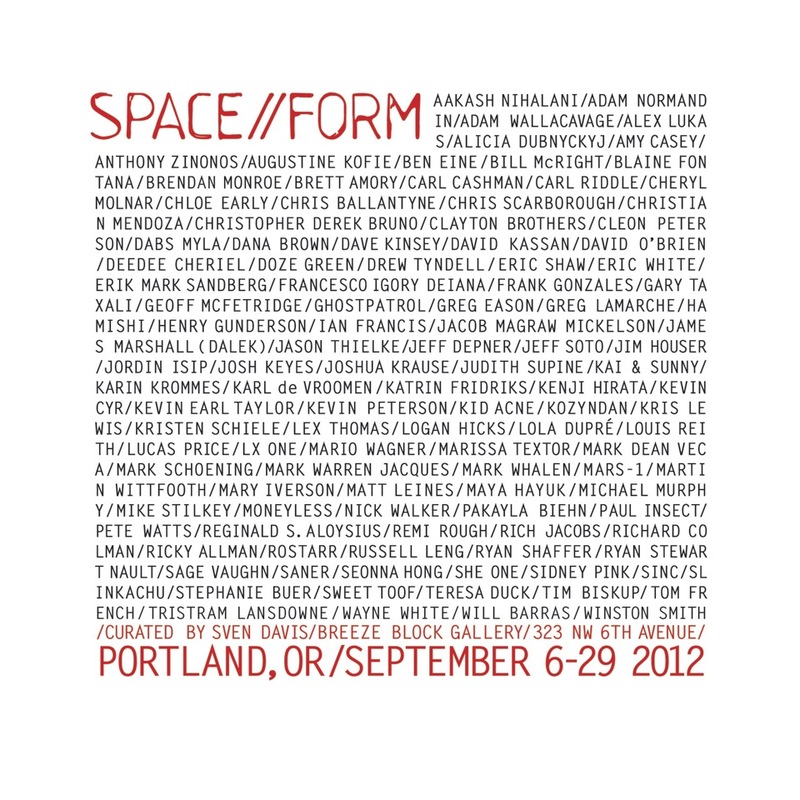 Cheryl Molnar, Chloe Early, Chris Ballantyne, Chris Scarborough, Christian Mendoza, Christopher Derek Bruno, Clayton Brothers, Cleon Peterson, Cyclops, Dabs Myla, Dalek, Dana Brown, Dave Kinsey, David Kassan, David O'Brien, Deedee Cheriel, Doze Green, Drew Tyndall, Eine, Eric Shaw, Eric White, Erik Mark Sandberg, Francesco Igory Deiana, Frank Gonzales, Gary Taxali, Geoff McFetridge, ghostpatrol, Greg Eason, Greg Lamarche, Hamishi, Henry Gunderson, Ian Francis, Jacob Magraw Mickelson, James Marshall, James Marshall (DALEK), Jason Thielke, Jeff Depner, Jeff Soto, Jim Houser, Jordin Isip, Josh Keyes, Joshua Krause, Judith Supine, Kai & Sunny, Karin Krommes, Karl de Vroomen, Katrin Fridriks, Kenji Hirata, Kevin Cyr, Kevin Earl Taylor, Kevin Peterson, Kid Acne, Kozyndan, Kris Lewis, Kristen Schiele, Lex Thomas, Logan Hicks, Lola Dupré, Louis Reith, Lucas Price, LX One, Mario Wagner, Marissa Textor, Mark Dean Veca, Mark Schoening, Mark Warren Jacques, Mark Whalen, Mars-1, Martin Wittfooth, Mary Iverson, Matt Leines, Maya Hayuk, Michael Murphy, Mike Stilkey, Moneyless, Nick Walker, Pakayla Biehn, Paul Insect, Pete Watts, Portland, Reginald S. Aloysius, Remi / Rough, Rich Jacobs, Richard Colman, Ricky Allman, ROSTARR, Russell Leng, Ryan Shaffer, Ryan Stewart Nault, Sage Vaughn, Saner, Seonna Hong, She One, Sidney Pink, Sinc, Slinkachu, Space//Form, Stephanie Buer, Sven Davis, Sweet Toof, Teresa Duck, Tim Biskup, Tom French, Tristram Lansdowne, Wayne White, Will Barras, Winston Smith.